"I've got grandchildren now and I'd love for them to see it." Fordham lost his opening group match to Adrian Lewis but he then beat Wayne Jones, meaning a 5-2 victory over Michael Smith would have been enough to see him through to the second round. But Smith, currently ninth in the Professional Darts Corporation's Order of Merit, won 5-2 to end Fordham's participation in Wolverhampton. "It's proved a few things for me," Fordham said. "I know I can compete now at a higher level. I want to just keep going forward now. "The crowd have been unbelievable. I've got to thank (chairman) Barry Hearn and the PDC for making the opportunity there for us. If I ever get back, I'll be back like a rocket." BDO world champion Scott Mitchell went into his final group match with no chance of qualifying for the last 16, but he ended his first Grand Slam of Darts appearance with an impressive 5-1 win over Dave Chisnall. "Before I came here I felt I could win two of the games," Mitchell said. "I'm over the moon to win one but of course I'd like to have won two and progressed." After failing to get through a difficult group which also contained Mervyn King and Peter Wright, it was quickly back to reality for the 45-year-old from Bransgore in the New Forest. "I've got to shoot home and cut a couple of football pitches for a couple of youth football teams I help out," he said. "And I've got to mark out five pitches for the weekend, so I'm hoping for no rain. "That's on my mind now - it was probably on my mind before I played 'Chizzy', which probably helped." The Grand Slam is the only major televised event in which players from darts' two rival organisations - the British Darts Organisation and the Professional Darts Corporation - compete against each other. Of the eight BDO players invited to play in the Grand Slam, only Martin Adams made it through to the knockout phase. The three-time world champion beat Ian White, Jelle Klaasen and Steve Beaton to finish top of his group. "I'm very pleased with three out of three," the 59-year-old said. "I've played three great players and I've won each game." 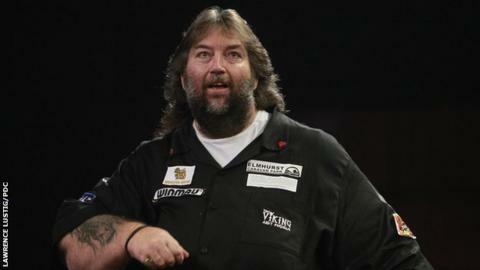 Adams had previously turned down invitations to play in the Grand Slam but accepted in 2015 after being asked to compete in Wolverhampton by the BDO. Many expected Adams to receive a rough reception from the audience, but he says that has not been the case. "I enjoy a good crowd and they've been a great crowd, despite what I've heard about on Facebook and despite what I've read on Twitter," he continued. "And I love playing darts. I'm enjoying myself." World number one Michael van Gerwen, world champion Gary Anderson and Phil Taylor all safely made it into the last 16 with three group victories. Defending champion Taylor has won the Grand Slam six times, but Scotland's Anderson and Van Gerwen of the Netherlands have yet to lift the trophy. "I don't think I've ever won my first three games in the Grand Slam," Anderson, 44, said. "Usually I lose the first game and then panic for the next two. "This is my favourite one and, of all the tournaments, this is one I'd like to get my hands on." Second-round ties are longer than group-stage matches, being played over the best of 19 legs rather than the best of nine. Van Gerwen, 26, added: "It gives me great confidence because I'm better in the long formats. "This is the format that I like - first to 10. I'm up for it."